March 01, 2019, 9:24 a.m. This month, Haribo achieved the highest uplift compared to January in Ad Awareness of any brand in the UK. As one of the most trusted confectioners in the European Trusted Brands consumer survey since 2003, it’s no secret that Haribo is a globally known and revered brand. Haribo’s current adverts feature a group of adults talking in everyday situations with children’s voices dubbed over the top, emphasising the famous slogan “Kids and grown-ups love it so, the happy world of Haribo”. Popular adverts include a rock band advertising the Haribo Supermix and a rugby team advertising Haribo Tangfastics. 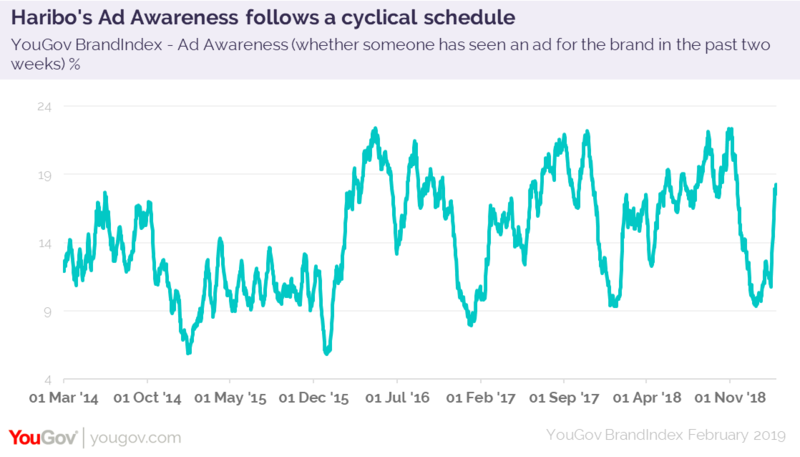 Despite having released no new adverts this year, YouGov BrandIndex data shows that the brand’s Ad Awareness score (whether someone has seen or heard an advert broadcast by a company in the past two weeks) improved by 9% - up from 11% to 20%. Our data would suggest this uptick is a return to normal ‘always on’ levels following a period of low activity – Haribo have often run the same popular adverts from previous years. 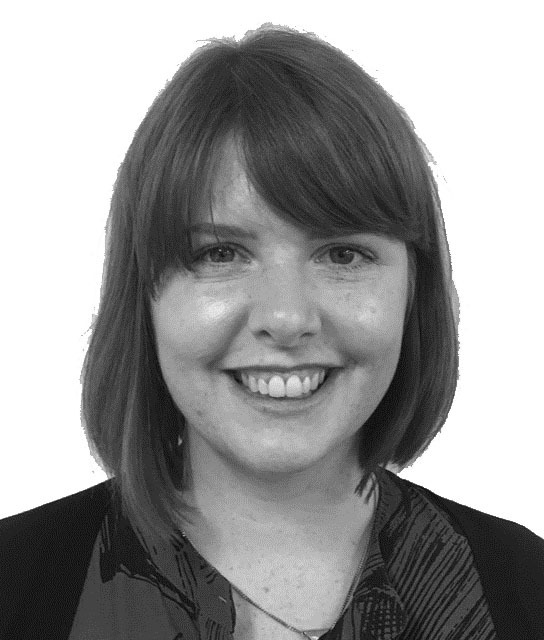 For many brands, simply re-running the same adverts as in previous years would not be enough to achieve adequate brand and advert awareness, and would be unlikely to propel the brand to the top of the most-improved Ad Awareness league table. However, a brand such as Haribo has high levels of public awareness and fondness to enable this, which can be seen when looking at the historical Ad Awareness of their adverts following the ‘off period’ between November and February. 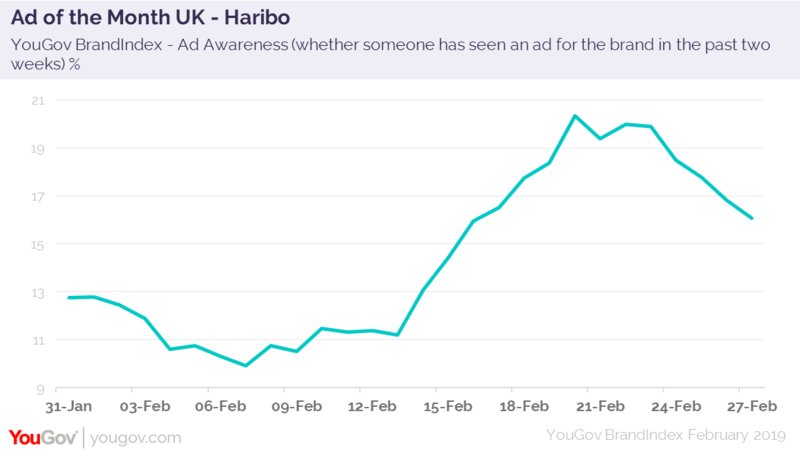 This is reflected by Haribo’s Consideration score (whether someone would consider purchasing from the brand in future) which has maintained a fairly steady level from the end of November at +16.9 to February at +19.4 (the periods in which ad awareness lulls). As a brand which has a strong legacy, a long history and has a fond place in many people’s childhoods, Haribo doesn’t need to work too hard to push their brand to the forefront. Recent YouGov data gave Haribo a 97% awareness rating with the British public, of which 63% held a positive opinion of the brand. This, alongside the pattern of positive consumer attitudes towards Haribo and consistent high ad awareness when running previously popular adverts, indicates that the brand does not need to invest heavily in new adverts in order to convey the brand’s message effectively. Data gathered using YouGov BrandIndex.